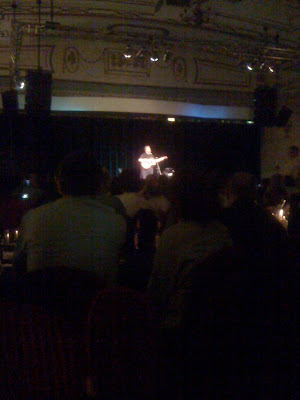 Pop intellectual turned folk troubadour Lloyd Cole strums for the Thornbury Theatre audience in Melbourne. Please be assured that I wasn't actually a kilometre away from the stage - it just seems that way. And whilst we're at the Thornbury Theatre, let us remember Candle Records heroes the Lucksmiths, captured here for posterity at their last but one ever gig. I attended this concert in my slippers. Which was nice. A crowd of backpackers chant for an English band at some theatre or other in Sydney. Said band were not as good as said crowd drunkenly believed. The unmistakably slight silhouette of Mr Jarvis Branson Cocker, erstwhile of Pulp, seen here at the Metro Theatre in Sydney for his first solo tour. Mrs Custard took this, hence the slightly higher than average picture quality. Mr Cocker again, flanked by Mr Steven Mackey (erstwhile of Pulp) and Mr Martin (M) Craft. Note other person taking photo of same scene. I assume theirs came out better than this. And last for today, my most favourite picture that I took on my old phone. If you don't know that's Mr Robert Forster, with bassist Adele Pickvance in the background. This was taken in the Studio Theatre, Sydney Opera House during Forster's first post Go-Betweens solo tour. The show was so good this was the only picture I got around to taking. Lloyd Cole AAAAAAAAAAAAAAAH! I had a teenage moment when I saw that. Your brilliant photography has made Robert Forster look a bit like Bryan Ferry.